18 years since the Chinese regime launched a campaign of persecution against practitioners of the Falun Gong spiritual faith, adherents are still being severely tortured in prison simply for their beliefs. Ms. Jiao Lili, 47, has suffered various kinds of torture over years of detention in multiple locations, most recently in the Gansu Women’s Prison, where she has been imprisoned since May 2016. Jiao, resident of a village in Qingyang City, Gansu Province located in central China, is a Falun Gong practitioner. In Nov. 2001, she was sentenced to the Gansu Women’s Prison after she hung up a Falun Gong banner in a public space, according to the website Minghui.org, which serves as a clearinghouse for information about the persecution of Falun Gong. Upon release, Jiao left the local area and moved to Lanzhou City in an attempt to escape authorities. In 2003, she was sentenced to five years in Lanzhou Women’s Prison. She was tortured there with electric batons until she passed out. In 2010, she was again arrested in Lanzhou City. After 36 days of abuse, she was sentenced for one and a half years in labor camp. However, her health was so poor that the labor camp refused to accept her. In Sept. 2014, as she was leaving her friend’s house where she was staying, local police took her away. She was then detained while awaiting sentencing in a court. In Oct. 2015, she was sentenced to eight years imprisonment at Gansu Women’s Prison. Since arriving at the prison in May 2016, Jiao has been severely tortured by fellow inmates at the behest of prison guards. Guards have given inmates an incentive to torture Falun Gong practitioners: in exchange for reduced sentences, the inmates could use whatever method they chose to solicit information from the practitioners. In particular, the guards wanted the Falun Gong adherents to give up the names of others in the area who practiced Falun Gong. The authorities could then find and arrest them. As a result, inmates would often shove and kick Jiao, beating her head and back repeatedly. Inmates forced her to squat on the ground for long periods of time, causing her legs to become severely swollen. If she moved slightly from her position, inmates would start beating and yelling at her. When Jiao said she could no longer endure the position, guards then used high-voltage electric batons to beat her, resulting in severe burns on her waist. Every day, guards would force her to write text that defamed Falun Gong, in an attempt to psychologically coerce her into giving up her faith. Earlier this year, while Jiao was getting out of bed, she fell due to the physical and emotional fatigue, and briefly went into a coma. Jiao was brought to the prison infirmary for a hastily-done check-up. Without any treatment, she was brought back to her cell. She can no longer see, and half her face is covered with black and blue bruises, reported Minghui. 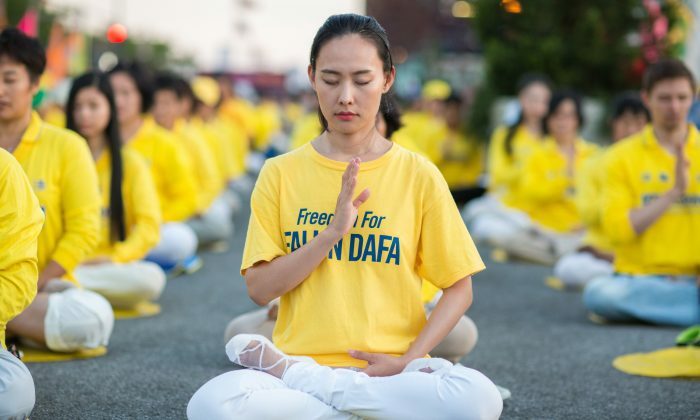 Falun Dafa, also known as Falun Gong, is an ancient self-improvement practice that involves meditation and living according to the principles of truthfulness, compassion, and tolerance. The practice’s benefits to physical and mental health led to its widespread popularity, with more than 70 million adherents in China by 1999, according to a state survey. Practitioners say their numbers reached more than 100 million. But Falun Gong’s popularity was perceived as a threat to the Chinese Communist Party’s authoritarian ideology. The Chinese regime launched a nationwide persecution of Falun Gong practitioners in July 1999. The Falun Dafa Information Center estimates that millions of Falun Gong adherents have been arrested and detained since the persecution started. The persecution has continued. In the lead-up to China’s major political event, the 19th National Congress, Minghui reported that over 200 Falun Gong practitioners in Harbin City in northeastern China have been harassed by police. Meanwhile, Minghui says Jiao’s situation is cause for great concern.